The Original IDT™ System – Original since 1968! The integrated dual feed from PFAFF® precisely feeds all types of fabric from the top and bottom for perfect stitching every time you sew. 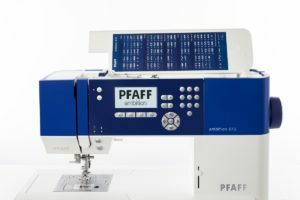 PFAFF® LCD Screen – Get all the sewing information you need directly on the screen! The Graphical User Interface is specially designed to meet your needs. Large Sewing Space – The sewing area to the right of the needle is 200mm, just about 8″, great for large sewing projects. 110 Stitches – Be astonished by the fascinating selection of PFAFF® high-quality stitches – unique embellishments, stitched perfectly up to 7mm. 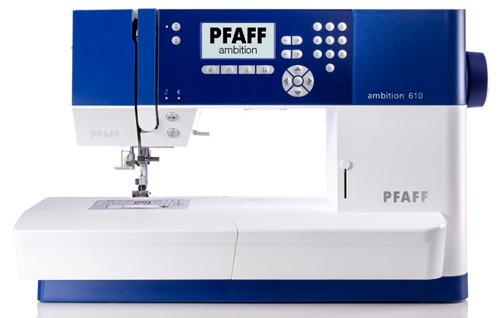 Speed Slider – Adjust sewing speed on your PFAFF® ambition™ 610 sewing machine for full control. 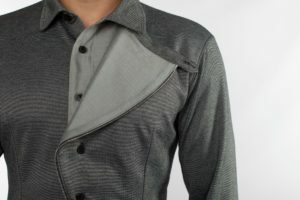 Elongation – Lengthen satin stitches and the entire stitch will be longer but the stitch density will remain the same. Twin Needle Program – Enter twin needle size to automatically adjust the stitch width. You can see the twin needle stitch on the screen. Free-Motion Mode – Simply drop the feed teeth for free-motion quilting, thread painting or darning. External Feed Teeth Drop is conveniently placed at the front of the PFAFF® ambition™ 610 sewing machine. One Step Buttonholes – With the One-Step Buttonhole Foot you can easily sew buttonholes with consistent results every time. 29 Needle Positions – For exact placement of your straight stitch. Perfect for top-stitching, edge stitching, under stitching, stitching in the ditch or quilting. Stitch Width Safety – Limits stitch width to center the needle while using the straight stich accessory to prevent needle breakage. Adjustable Thread Tension – The recommended thread tension setting for the selected stitch is displayed on the screen. Extra Presser Foot Lift – Raises the presser foot to its highest point while dropping the feed teeth so thick fabrics can be placed easily under the presser foot. Info Button – Simply touch to see important sewing recommendations on the graphic screen. Presser Foot Pressure – Can be adjusted when using specialty techniques or when sewing with varying fabric weights. Needle Up/Down – Set needle to stop up or down in the fabric for pivoting, applique and much more. Start/Stop Button – Sew without using the foot control. Makes sewing long seams, free motion and buttonholes easy. Immediate Tie-Off – When pressed the PFAFF® ambition™ 610 will tie-off and stop automatically for a quick and easy finish. Built-in Needle Threader – Makes threading easy and reduces eye strain. LED Illuminated Workspace – Designed to give even light across the entire work space. Bobbin Winding from the Needle – No need to rethread when winding your bobbin directly from the needle. Winding stops automatically when your bobbin is full. Jam Proof Rotary Hook – No threads caught in bobbin area. 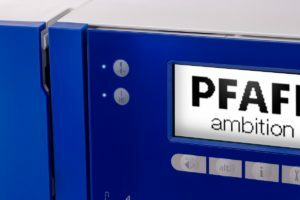 Languages – Choose from 13 languages in the Settings menu to a make sure your PFAFF® ambition™ 610 sewing machine speaks the same language as you. Inch/cm Ruler on the Base Plate – Convenient measuring directly on your PFAFF® ambition™ 610 sewing machine. Hard Cover – Protect your sewing machine when transporting it. Dust free storage for your PFAFF® ambition™ 610 sewing machine. 0A Standard with IDT™ – is used mainly for straight and zigzag stitching with a stitch length longer than 1.0mm. 1A Fancy Stitch Foot with IDT™ – is used for decorative stitches. The grooves on the underside of the foot is designed to flow smoothly over the stitches. 2A Fancy Stitch Foot with IDT™ – When sewing decorative stitches or short zigzag stitches and other utility stitches with less than 1.0mm stitch length, use this foot. The groove on the underside of the foot is designed to flow smoothly over the stitches. 3 Blind Hem Foot with IDT™ – is used for blind hem stitches. The toe of the foot guides the fabric. The red guide of the foot is designed to ride along the fold of the hem edge. 4 Zipper Foot with IDT™ – can be snapped on either the right or the left of the needle, making it easy to sew close to both sides of the zipper teeth. Move the needle position to the right or left to sew closer to zipper teeth. 5B One Step Buttonhole Foot – Slide a button in the back of the foot, attach it to your machine. Stitch the perfect size buttonhole. Stop in and ask us about the ambition™ 610. FREE individual instructions on your new PFAFF! FREE Maintenance Agreement with every machine purchased. FREE customer rewards program gives you at least 20% off all regular priced notions and PFAFF branded products for 90 days after your sewing machine purchase! Guaranteed 90 day trade-up policy toward the purchase of any PFAFF of greater value. On site Factory trained technicians combined with an extensive parts inventory. 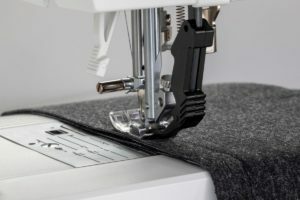 Owner, John, and manager, Barbara have combined experience of over 4 decades in the sewing machine business with PFAFF as well as other major brands. Copyright © by New England Sewing. All rights reserved.